Successfully Added DOOGEE X6 Pro Smartphone - 5.5 Inch HD Screen, Android 5.1, 4G, 2GB RAM + 16GB ROM, Smart Wake, Gesture Sensing (Black) to your Shopping Cart. 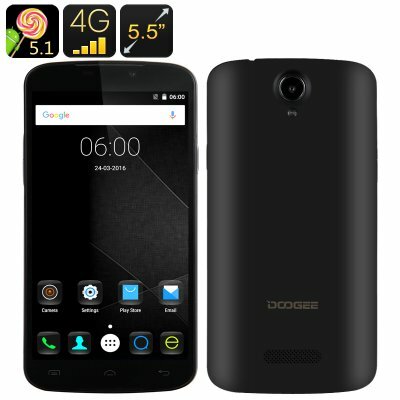 The DOOGEE X6 Pro is an Android smartphone with a nice set of functions. You will not only have a 5.5 inch HD screen and Android 5.1 interface, but also some nice extras like Smart Wake, Gesture Sensing and more. Watch movies and play games on a nice 5.5 inch HD screen and enjoy all the benefits of Android 5.1: a familiar friendly interface and unlimited Play Store access. So you are free to get more apps, tools and games whenever you need them. The smartphone also comes with Smart Wake and Gesture Sensing. Both features let you navigate your smartphone more efficiently. Smart Wake gives you access to selected apps right from the locked screen. Simply draw a “C” for Camera and you are all set to snap a photo! Gesture Sensing allows you to use simple hand movements for navigation, like skipping music tracks or switching between apps. You will have 16GB of internal memory + 32GB on an SD card. The Android smartphone also features 4G connectivity on two SIM cards – so you will not only stay connected, but also have the option of splitting your personal and business phone accounts. The DOOGEE X6 Pro comes with a 3000mAh battery offering 10 hours of non-stop talking time and 72 hours on standby. The DOOGEE X6 Pro Smartphone comes with a 12 months warranty, brought to you by the leader in electronic devices as well as wholesale Android Phones..